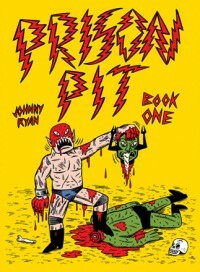 I don’t know much about Johnny Ryan other than a handful of his short strips passed onto me by friends with an “oh, man, look at this,” so when I got the chance to read his newest full-length story, Prison Pit: Book One , I leapt at it. I’m glad I did, because it gave me the chance to read a story about a brutal alien protagonist dropped onto a prison planet inhabited by strange plants, hideous creatures, and a gang of inmates even more brutal and ridiculous than the lead. Amazingly, I was sucked in by the whole enterprise, laughing and groaning and shaking my head. The escalation of violence includes the protagonist chopping someone’s head off with the ax-adorned hand of a third character. As far as gross goes, a drooling, drug-addled slug is enough on its own, but Ryan carries the nasty creature to a surprisingly logical conclusion. Even more amazingly, particularly to me, it left me thinking about why I enjoyed it so much and why I enjoy the other books, movies, and shows I enjoy. Most would dismiss the book as juvenile and amateurish, either due to Ryan’s reputation or a cursory flip through the book itself, but I was grabbed, and quite unexpectedly. I’ve never had much use for indie comics, finding most of them live up to the stereotype of ugly art and self-indulgence. I prefer my fantasies a little more fantastical and a little less “I’m going to tell you about all the chicks I whack it to” accompanied by amateurish art. 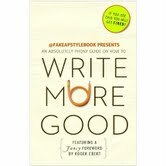 But this book isn’t as amateurish as I may have thought. It’s scarcely what I would call “elegant in its simplicity” but with subject matter like this photo-realistic art and emotional weight aren’t called for. These are ugly characters in a gross situation, and Prison Pit treats them with all the indulgence and nastiness needed.